Materials make up to 7 decorations for the festive season! 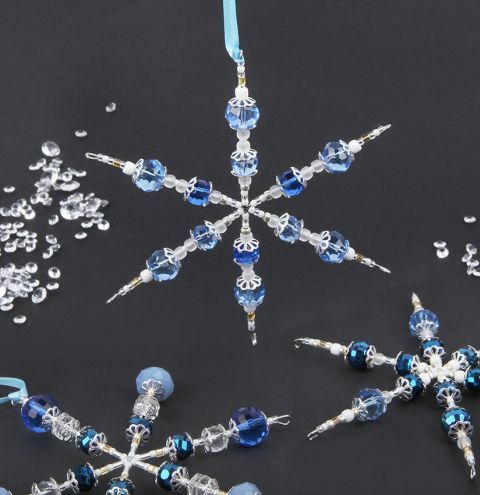 Design your own shimmering Blue Snowflake Decorations for your Christmas tree using a fabulous range of glass beads, seed beads and cute bead caps. Find the pink variation of this design HERE. Seperate all of your beads out into their different shapes, sizes and styles so you know how many you have before you create your 7 snowflake decorations. You will have plenty of seed beads, bead caps, bugle beads and silver glass beads to spread out the use of your sparkling blue glass beads, which are more limited in number. Take one of your snowflake frames and choose the beads and seed beads you'd like to thread onto each of the rods. Decide on your pattern and thread them onto one of the rods and loop the end (make sure to leave a minimum of 1cm of wire before looping otherwise the loop will be too small and hard to turn). Repeat for all 6 sides and loop the ends. If you find your beads keep moving on the snowflake, try adding a small drop of glue or clear nail polish to the last bead or two to hold the rest in place. Continue to decorate your 7 snowflake bases and loop each of the 6 sides to hold the beads in place. If you want to take your design further, try threading spare beads onto a headpin and attaching these to 5 of your loops as dangling charms! Once you have finished, take a 8" length of ribbon and knot it in the centre to one of the loops. Knot again near the top of the two ends of ribbon to make a hanging loop, ready for using as a decoration!